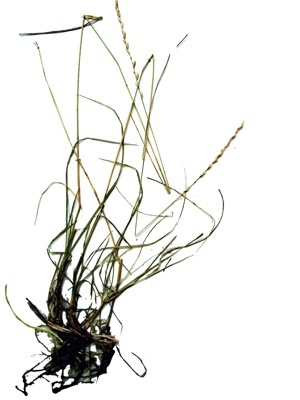 AgroAtlas - Relatives - Agropyron tanaiticum Nevski - Don Wheatgrass. Family Poaceae Benth. genus Agropyron Gaertn. Perennial grass. Plants rhizomatous. Stems 30-70 cm tall. Leaves glaucous-green, mainly flat, 2-5(7) mm wide, glabrous beneath, shortly pubescent above; sheaths glabrous or lower ones pubescent. Spikes linear, (4)7-16 cm long, (5)7-12(14) mm wide. Spikelets 7-12(14) mm long, 3-7(8) flowered, in the lower part of spike distant; glumes keeled, acute, glabrous, less often hairy at keel, 3-7 mm long; lemma lanceolate, awnless, 6-8 mm long, long-hairy, less often glabrous. Anthers slightly shorter than lemma. Flowers in May - June. Anemophilous. 2n=? Endemic to the southeastern European part of the former USSR. Occurs among hillocky sands of upper stream terraces in the Seversky Donets River basin. Belongs to pioneers of hillocky sands sodding. On poorly sodded sands, it occurs in numbers; on medium-sodded sands its phytocenotic part sharply decreases; does not occur on highly sodded sands.